Moving the Needle: Jamey Carroll can’t handle the slow bouncer, -.437 WPA. The Dodgers appeared to have this one. They staved off a rally in the eighth and then sent out Jonathan Broxton to close it in the ninth. He got the first two guys, but then walked Emilio Bonifacio. How one does that, with two outs in the bottom of the ninth, I do not know. That set up Hanley Ramirez to pinch hit, and he delivered a single to put runners on first and third. Scott Cousins came up next, and he hit a slow bouncer to short. 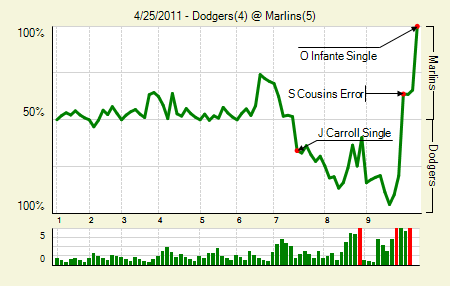 But Carroll whiffed on it, allowing the tying run to score. 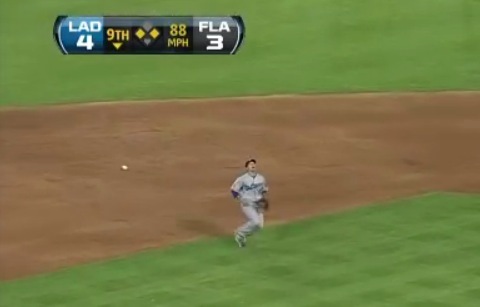 Two batters later, Omar Infante delivered the single that won it for the Marlins. Chris Coghlan: 3 for 4, 2 HR, 1 BB. The walk was an intentional one in the ninth, which was a smart move, considering his two previous homers and the open base at first (and the meaninglessness of Coghlan’s run). Jon Garland: 7 IP, 4 H, 2 R, 2 ER, 1 BB, 4 K, 2 HR. The two Coghlan homers were all he surrendered. Moving the Needle: Alberto Callaspo sets up the opening round of scoring, +.114 WPA. This game started to turn in the second inning. Vernon Wells opened the frame with a single, which Callaspo followed with a double to left that put runners on first and third with none out. 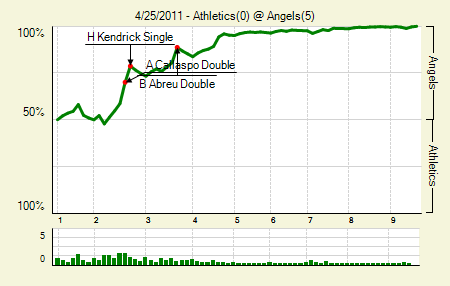 Callaspo’s hit, apparently, was a more dramatic swing than Howie Kendrick’s follow-up two-RBI single. The Angels tacked on another in the third, and then two more in the fourth to set up a 5-0 lead, which was all they’d need to take home this game. Jered Weaver: 9 IP, 7 H, 0 R, 0 ER, 1 BB, 10 K. There have been other pitchers who have gone from a league average strikeout rate to a batter per inning, and then maintained it. Justin Verlander and Jon Lester stand out there. But Weaver made the transition a bit late, in his age-27 season last year. It seemingly fits him well. Howie Kendrick: 2 for 4. He got off to a blazing start, but then went 1 for 14 in the Boston series. It appears he’s getting right back on track. Moving the Needle: Chris Young hits one to the overhang in center, +.192 WPA. 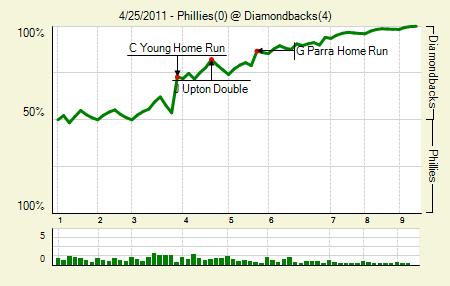 It didn’t exactly look like a home run swing, but it generated home run power. Young absolutely destroyed a Cliff Lee offering, sending it to the deck above the 413 sign in center. The True Distance was set at 432 feet, the longest homer of the evening, which was all the Diamondbacks would need, though they’d tack on a few more against Lee. Ian Kennedy: 9 IP, 3 H, 0 R, 0 BB, 10 K. That’s his first career complete game and only his second career game with 10+ strikeouts. Without a doubt the best start of his career. Diamondbacks Offense: 4 for 29, 1 2B, 2 HR, 1 BB. That is one of the least wasteful ways to score four runs. Moving the Needle: Mark Teixeira grounds into a twin killing, -.191 WPA. Again, the White Sox couldn’t get much offense going. It’s a good thing, then, that their pitching held the Yankees in check all game. The Yankees appeared to get something started in the ninth, when Curtis Granderson led off with a single down the right field line. 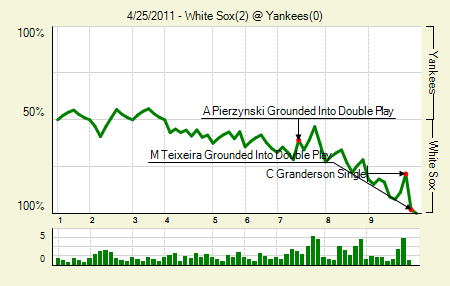 But Teixeira erased him when he bounced one right to Paul Konerko at first, starting the old 3-6-1 and putting the tying run back in the on-deck circle. Philip Humber: 7 IP, 1 H, 0 R, 2 BB, 5 K. He had a no-no going through 6.1, which had Yankees fans freaking out. Good for Humber for turning in a performance that the White Sox really needed. A.J. Burnett: 8 IP, 3 H, 1 R, 1 ER, 2 BB, 2 K, 10 GB. Burnett continued his solid April, but his team didn’t back him up. This is only the second time a Yankees starter has gone eight, though it’s also the second time in three days it happened. 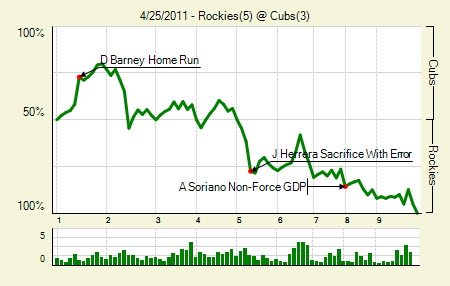 Moving the Needle: Starlin Castro ‘s error leads to two runs and a tie game, -.197 WPA. The second inning is one Castro would like to scrub from his memory. Unfortunately, no matter how he remembers it, the errors will remain in the record books. He started the inning by booting a ball, allowing a man to reach. Then, after a single put men on first and third, another bouncer headed his way. He misplayed that one, too, allowing the first run to score. Finally, it appeared he got a break with a grounder that could have been a double play. But he threw wide to second and the ball scooted all the way to the bullpen area in right, allowing both base runners to score, tying the game. The last miscue cost him the 19.7% win expectancy. All in all, his errors cost his team -.293 WPA. The Rockies scored another run on an error in the fifth. Matt Garza: 6 IP, 3 H, 5 R, 1 ER, 1 BB, 7 K. It’s not his fault his defense made him throw so many more pitches. Jeff Baker: 3 for 4, 1 2B, 1 BB. He and Darwin Barney had the only extra base hits for the team. Without the errors it might have been enough to win. Moving the Needle: Corey Patterson goes deep, +.320 WPA. This game featured one of the best pitching matchups of the evening, and for four innings it lived up to the billing. But in the fifth things came unraveled for Colby Lewis . 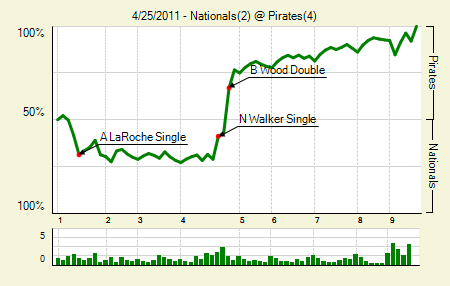 He walked Travis Snider to lead things off, and then, after recording two outs, allowed another single. That brought up Patterson, though things looked good as Lewis got him in an 0-2 hole. He then delivered a shoulder-level pitch, which has never stopped Patterson from swinging before. This time he lifted it into the right field stands for a three-run shot to open the scoring. 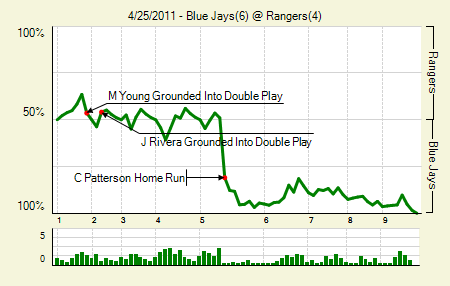 The Jays followed with two more homers in the inning, giving them a comfortable six-run lead. Michael Young: 2 for 4, 2 2B. His hot streak is well-timed for the Rangers, as Josh Hamilton sits on the shelf. Still, he has drawn just one walk on the season. Jose Bautista: 1 for 2, 1 HR, 2 BB. Now has a 24% walk rate and 8 HR in his first 87 PA.
Juan Rivera : 1 for 3, 1 HR, 1 BB. That was his first extra base hit of the year. It has not been a kind transition from Cali to Canada. Moving the Needle: Jay Bruce punishes a baseball, +.145 WPA. The Reds made this one a snoozer pretty early on. They picked up a run in the second, but in the third they decided to have no mercy on Chris Narveson. Bruce got things started with a mammoth two-run blast out to right. Even the pitcher got in on the action, adding an RBI single that made it 7-0 later that inning. 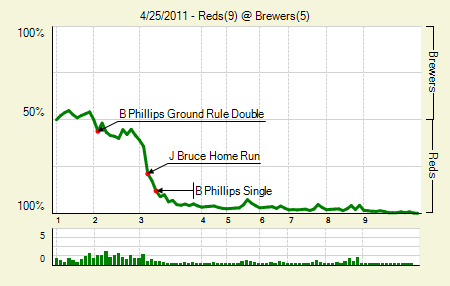 The Brewers added a few runs here and there, but it was not nearly enough to overcome the Reds’ onslaught. Bronson Arroyo: 6.1 IP, 6 H, 2 R, 1 ER, 2 BB, 4 K. The only run he himself allowed was on an error, though one of his bequeathed guys came around to score. Joey Votto: 1 for 5, 1 2B. It’s become a disappointment when Votto reaches only once in a game. Brandon Phillips: 3 for 4, 1 2B, 1 BB. He drove in three of the Reds runs after scoring the first one. Moving the Needle: Brandon Wood — Brandon Wood — doubles home a pair, +.242 WPA. In his Pirates debut Wood looked at least a little impressive. That is, he went 1 for 4 with a two-RBI double, and he didn’t even strike out once. Wood’s hit put the Pirates up 3-2, after being down 2-1. Wood would also come around to score later in the inning. It’s too soon to call this move a win for the Pirates, but what the hell. I’ll call it a win right now and deal with the consequences later. Paul Maholm: 7 IP, 4 H, 2 R, 2 ER, 2 BB, 8 K. It seems like it should be a long time since he struck out eight guys in a game, but it actually happened seven starts ago, on September 10. Jayson Werth: 2 for 3, 1 2B, 1 BB. He also had an error that allowed the Pirates to score their first run, and which set up the four-run inning that ended up being the difference. Moving the Needle: Ryan Ludwick walks off with a homer, +.382 WPA. Off the bat this looked like a no-doubt shot, but Martin Prado actually had a shot to catch this one. Unfortunately for him, it cleared the wall, giving San Diego the victory. 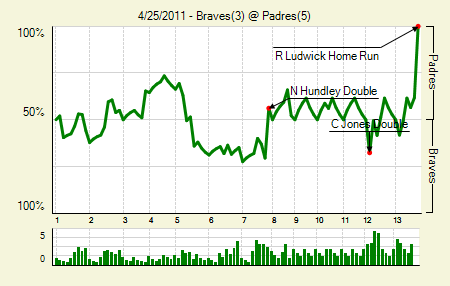 The Braves did blow a golden opportunity in the 12th, when Chipper Jones led off with a double. But the pinch runner got nabbed trying to take third on a ground ball. The walk-off was Ludwick’s second homer of the game. Brad Hawpe: 2 for 5, 1 2B. That’s his first extra base hit of the year, and, sadly, only his fourth and fifth hits of the year. What happened to this guy? We hoped you liked reading The Morning After: Game Recaps for April 25th by Joe Pawlikowski! One Night Only: Now with Pitcher and Game NERD! Regarding Cubs-Rockies, you’re forgetting Kosuke Fukudome, who went for the Bizzarro Platinum Sombrero, going 5-for-5, all singles.